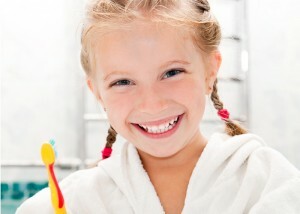 Since we were children, we have been told about the importance of brushing our teeth properly to help prevent cavities. Did you know that fluoride can also play a big role in cavity prevention? Let’s take a closer look at what causes cavities and how fluoride can help in the prevention of cavities. Tooth decay starts when the outer surface of the tooth, the enamel, is attacked by acid. The acid comes from bacteria that lives on the enamel called plaque. When you consume food or drinks that contain sugar the bacteria in the plaque rapidly converts the sugar to acid. The plaque can hold the acid to the teeth for 2 hours before your saliva neutralizes it. While the plaque is acidic, some of the enamel is dissolved. This process is called demineralization. (Enamel is largely composed of calcium and phosphate minerals). However, once the plaque acid has been neutralized by the saliva the minerals can return to the surface of the tooth. This is called remineralization. Unfortunately, the remineralization process is limited if sugar enters the mouth too frequently causing a mineral loss that is too great. When this happens, the bacteria can penetrate and infect the inner layer of the tooth, thus causing a cavity. If the cavity is left untreated, it will eventually destroy the tooth and cause pain in the form of an abscess. If kids ingest enough fluoride during the time of their enamel development (up to 7 years old), the fluoride will alter the structure of the enamel that is developing by making it more resistant to acid attacks. When your teeth are subject to alternating periods of demineralization and remineralization (as described above), the low levels of fluoride in the plaque and saliva will encourage remineralization and help to ensure the new enamel that is laid down is stronger. Low fluoride may sound like a bad thing, but the low levels will slowly improve the strength of the tooth enamel and its ability to resist acid attacks. This was first discovered in 1966, and means that early signs of decay can be stopped and the enamel can heal itself. This discovery led to a huge improvement in dental health since introducing fluoride into toothpaste in the mid 1970’s. Fluoride also works by reducing the ability of the bacteria in plaque to make acid. This is a huge component in preventing tooth decay. This causes the ability of the bacteria in plaque to concentrate lower levels and the fluoride on the surface of the tooth to rise to a level that inhibits some of the enzymes that help the bacteria to produce acid. Another affect is that if a sufficient amount of fluoride is ingested during childhood during tooth development is that it can affect the depth of the grooves on the biting surfaces of your teeth. In children who grow up where their drinking water is fluoridated, the grooves have a tendency to be more shallow, which inhibits the ability of the place to be undisturbed. Brush with toothpaste that contains fluoride after eating or drinking. Brush at least twice per day or after each meal of possible. Floss after each meal. If you can’t brush your teeth after a meal, at least try to rinse your mouth with water until you can get home to brush your teeth. If we feel you are a high risk for developing cavities, we may suggest you use a mouth wash with fluoride. Visit our office for regular checkups at least every 6 months. We will recommend a schedule that is right for you. Dental sealants for your teeth could be another option we can discuss. Fluoride treatments during your check ups may bring some benefit. We will be able to let you know. Avoid foods that get stuck in your teeth, as well as sugary and acidic foods. Go for foods like fresh fruits and vegetables. They increase saliva flow and help wash plaque bacteria away. If you have concerns about tooth decay and cavity prevention, you need to consult with your dentist as soon as you can. At Simply Smiles Dentistry, we can provide you with the proper guidance and treatment you need to keep your teeth cavity free.